Cho (gochu) jang (or chojang for short) is a unique spicy-sweet red chili pepper sauce. It gives off a sweet, spicy flavor and goes well with all kinds of mixed rice dishes such as bibimbop and hweh dupbop or even noodle dishes such as jangban guksu. It can also be used as a vegetable dipping sauce or a spicy salad dressing. Alternatively, when eating hweh (sashimi), chojang can be used as a dipping sauce as opposed to the standard soy sauce mixed with wasabi. 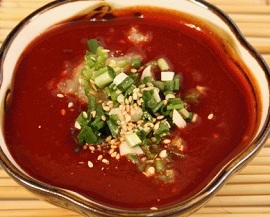 It’s a very simple sauce to make using few ingredients such as gochujang, vinegar, and sugar. Other optional ingredients can include sesame oil, minced garlic and even finely chopped green onions. Depending on the brand of gochujang, more or less vinegar and sugar may be used, depending on the preference in the level of thickness as well as spiciness. Chojang can also be purchased in squeezable bottles much like ketchup at your local Korean supermarkets. If sauce consistency is too thick, thin out with some warm water.